The forces of the deposed King James prepare for battle with those of the new King William ~ which is of little consequence to an Aberdeen beggar who is about to be murdered for sport. Saved by one Simon Fraser of Beaufort, who calls himself The Young MacShimi, the poor man is renamed Bolla after a Clan Fraser tradition… and finds himself dragged unwillingly into a world of war and intrigue. Simon, seemingly a Jacobite, will stop at nothing to become MacShimi, the Fraser chief. As those above him begin to be removed from his path ~ and he sets himself at odds with one of the most powerful clans in Scotland ~ the endlessly ambitious character becomes known throughout the fledgling United Kingdom as The Fox. master's dance of death and deceit leads Clan Fraser towards a dangerous, dramatic reckoning. 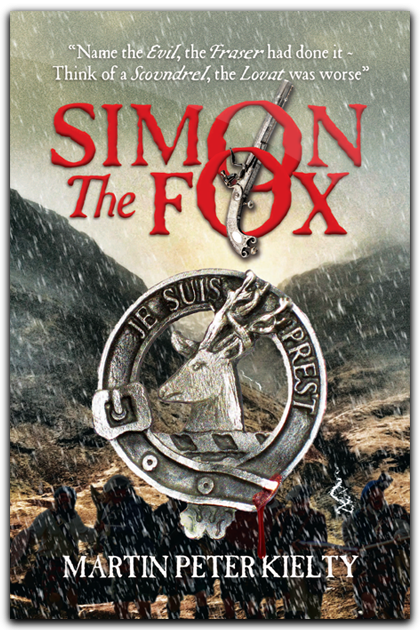 A novel blending historical fiction with action, adventure and murder-mystery, based on the real-life Simon ‘The Fox’ Fraser, 11th Lord Lovat and chief of Clan Fraser, who was executed for treason in 1747 after leading his people through decades of political and military turmoil. While many of the scenes are purely fictional, most are based on the records and writings of The Fox himself ~ who, in the century after his death, inspired more than 200 books about his life.